I’ve been reading the Monthly Army Lists recently. 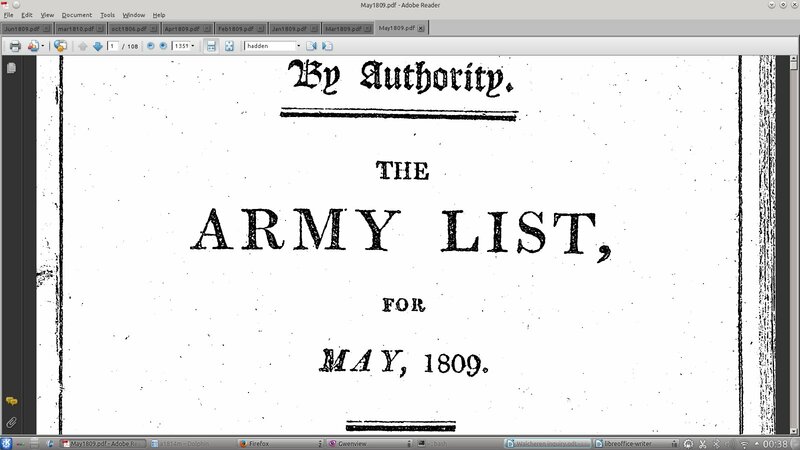 I know, I know… as a friend already told me, “Who reads the Army Lists, other than officers keen on getting promoted?” The answer is, “Historians who want to find out what district their subject was attached to during the Napoleonic Wars, and who their staff were”. I will give out no prizes for anyone who guesses which army officer I’ve been tracking through the army lists. In the 1790s Britain and Ireland were partitioned up into military districts, and each appointed a commander-in-chief with his own staff. Lord Chatham (YES! you guessed it!) spent most of his time attached to the Southern District, where he served under Sir David Dundas, before being promoted in 1806 to the command of the Eastern District. Another familiar name that crops up is that of Lt. Col. Cary, who appears for the first time as Assistant Adjutant General in June 1807. 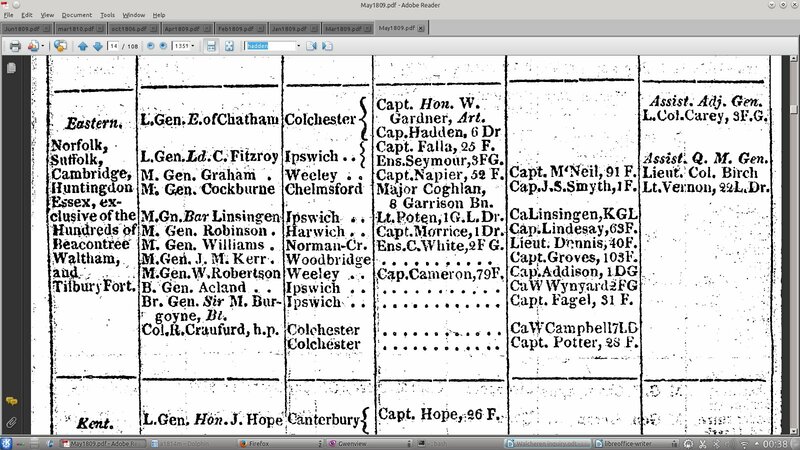 “Captain Felix” of the 36th is something of a mystery, not appearing in the Monthly Army List for 1809 or 1810 in that regiment. But note that the Tradesman, or Commercial Magazine (vol 3, 1809), 168 leaves Felix out and in his place is a certain “Capt. Falla, 25th Foot”. Leaving out Major Linsingen, and the Manners brothers (both of them sons of Charles, 4th Duke of Rutland, Chatham’s old buddy), who were these men? Chatham would have known them well from the Eastern District, and was obviously inclined to trust them. Conversely, they would have known Chatham well and, presumably, been accustomed to his way of doing business (by which I mean his habit of getting up about 12 o’clock noon). Below is some of the information I’ve managed to find on Chatham’s chosen men. They were not, after all, merely names in the Army Gazette, but real men with their own lives and stories to tell. Bradford (with the 11th Foot in 1809) was the youngest son of Thomas Bradford of Ashdown Park, Sussex. He was born on 25 June 1781. He was Chatham’s longest-serving ADC in the Eastern District, although also the first to leave him, at the end of 1808, when he was sent out with Sir John Moore to Corunna. He had already previously served at Copenhagen in 1807. He survived the retreat, and Chatham remembered him fondly enough to appoint him First Aide-de-Camp at Walcheren. Bradford was tasked with bringing home Chatham’s official dispatch reporting the fall of Flushing in August 1809, and received a reward of £500 for the job. After Walcheren he went back to the Peninsula, where he saw action as Assistant Adjutant-General at Salamanca and Vittoria, and Nivelles and Toulouse, among others. As a result he was created a Knight of the Bath in January 1815. He fought at Waterloo, but was badly wounded during the course of the battle. Unfortunately he never recovered, and died on 17 December 1816 at Lilliers, in France, as a result of the wound he had received over a year earlier. He reached the rank of Lieutenant-Colonel. Gardner was the son of Admiral Alan, Lord Gardner, who had been Lord Chatham’s friend and colleague on the Board of Admiralty during Chatham’s tenure as First Lord. William Henry was thus also the brother of Alan Hyde, Lord Gardner, who commanded one of the naval divisions during the expedition to Walcheren. His connections to the Walcheren high command did not end there: in 1805 he had married Elizabeth Lydia Fyers, the daughter of William Fyers, who had served as Chief Engineer during the expedition. He was born on 6 October 1774 and died 15 December 1856. He reached the rank of General. Hadden was the son of James Murray Hadden, Chatham’s Surveyor-General of the Ordnance (and close friend). Hadden was in the 6th (Inniskilling) Dragoons in 1809, as a Captain: interestingly, he appears in May 1814 as a Lieutenant in the 4th. One reason for this demotion may have been his odd behaviour. According to anecdote, he was drummed out of the army for asking Queen Adelaide to dance without an introduction, but this doesn’t match up with his lifespan and I have not found any evidence of it. According to a website on the history of Harpenden in Hertfordshire, where his family had a house, Hadden threatened to muder his friend the Dean of Liverpool as a result of a vision and was subsequently locked away in a lunatic asylum. Whether the story is true or not is unclear, but like Bradford he certainly died young. Falla came from an established Jersey family. His brother, Thomas, was also in the army, but killed at the siege of Seringapatam in 1799. He was in Egypt in 1801 before joining Chatham’s staff, and would follow Chatham to Gibraltar, where Chatham had him appointed Town Major in 1822. Falla remained Town Major for twenty-five years: he retired in 1847, twelve years after Chatham himself had died. Falla then returned to his native Jersey, where he died at St Helier, on 14 March 1851. He reached the rank of Colonel. Like Falla, Carey was a native of the Channel Islands — of Guernsey, to be precise. He was by far the most active of all the aides, and thus the easiest one to track in the records. He was the sixth son of a local magnate, and entered the army as an ensign in the 3rd Foot Guards (Chatham’s old regiment) in January 1794. He participated in the disastrous Flanders campaign of 1794-5. He was at the Helder in 1799, where he served as Adjutant for his regiment. Carey earned himself a reputation for hard work: a Horseguards official said, “Carey is one of the most zealous and efficient adjutants I ever knew: there is no nonsense about him; however irksome may be the orders he receives, he sets to work, and executes them on the instant with cheerfulness and alacrity, never starting or thinking of a difficulty”. He was in Egypt in 1801, where he contracted the eye disease opthalmia and nearly lost his sight. Following his recovery, he accompanied the abortive British expedition to North Germany in 1805 as assistant adjutant general to the forces. He was also at Copenhagen in 1807. Like Bradford, he served in the Peninsula in 1808 and 1809, and was present at both Vimeiro (where he was wounded) and Corunna. Although he joined Chatham’s staff on the Eastern District officially in 1807, he claimed to have been familiar with him since 1804, although in what capacity I have not been able to identify. By 1809, however, when Carey went with Chatham to Walcheren, the two men were close: as a short biography of Carey in the History of Guernsey put it, he and Chatham “enjoyed the most intimate and lasting friendship”. Carey was certainly devoted to Chatham: “The more I see of him, the more I am convinced that in understanding few equal him, & in Honor or Integrity He cannot be excelled”. Carey was militant in the defence of his commander after the end of the Walcheren campaign. He interceded on Chatham’s behalf with various political and military figures, but to no avail. Carey remained, apparently by choice, with Chatham in the Eastern District until 1814, when he was promoted to the rank of Major-General. Unfortunately at this time an old illness recurred (malaria, perhaps, from Walcheren?) and he was forced to leave the army. He was not, therefore, able to participate in the Waterloo campaign. 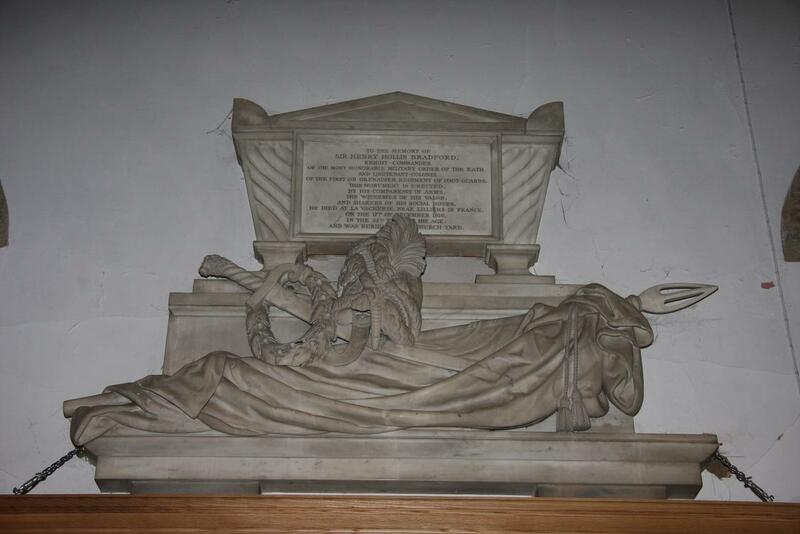 His health gradually failed until he died in London on 9 November 1825. I would very much like to know what Chatham’s reaction was to his death, for of all his aides Carey had been the most faithful. This entry was posted in Uncategorized and tagged 2nd earl of chatham, aides de camp, british military history, daniel falla, earl of chatham, henry hollis bradford, john pitt 2nd earl of chatham, military history, napoleonic wars, peninsular wars, thomas carey, walcheren 1809, walcheren campaign, walcheren expedition, wellington's army, william henry gardner, willian frederick hadden. Bookmark the permalink. Thanks for putting this together, Jacqueline Reiter. It should prove useful, especially if eventually fleshed out in a couple of places, as you suggest yourself here.